If you are familiar with parrots, then you have probably heard about some of the problematic issues they develop in a domestic setting. Anxiety and boredom leading to feather plucking, skin mutilation and outrageous, terrible behavior. Ear splitting screaming and the receipt of bite wounds are commonplace occurrences for parrot owners. But let’s try to make this image as clear and specific as we can. Do all types of parrots struggle with these problems? Certainly all types of parrots considered to be pets living in a domestic setting will begin to pull out their own feathers at some point in their lives. The screaming and biting is also par for the course when living with or handling parrots. But what about the skin mutilation? Will all types of parrots eventually mutilate and destroy their skin, placing their own lives in danger from infection? Usually not. The type of parrot most known for this extreme and horrific behavior is the Cockatoo. All breeds of Cockatoo. If you look around hard enough, you can find a few occasional cases in non-Cockatoo parrots. 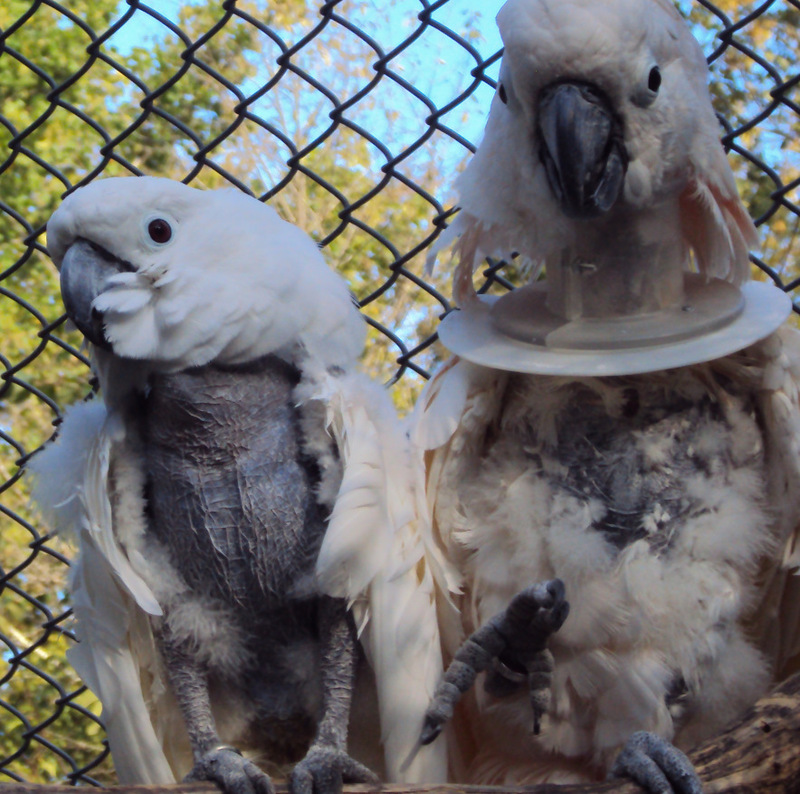 But the vast majority of skin mutilation is found within the numerous breeds of Cockatoo. But why are they so affected? Another disturbing phenomenon one may witness while handling and caring for parrots is seizures. Certain types of parrots will experience seizures triggered by elevated levels of stress. Can you guess what kind of parrot is most commonly known to suffer from stress-related seizures? That’s right; Cockatoo. All breeds of Cockatoo. Again, you can find occasional instances of seizures in other types of parrots. But those cases always involve some pathology (disease). In other words, for a non-Cockatoo parrot to have a seizure, it must be sick or have a disease. The majority of seizure activity plaguing Cockatoos does not involve disease. These we call non-pathological seizures. Put simply, most Cockatoos are always so nervous, that it doesn’t take much additional stress to send them into a seizure. Now, I realize it is hard to look at a Cockatoo in the throes of a seizure and imagine that there is no disease at work. But a thorough and exhaustive medical examination will find nothing out of the ordinary in the bird’s anatomy or physiology that is causing the seizures. The suspicion of pathology is further dismissed if the phenomenon is seen as commonplace for the breed. And in this case, it is. Please note however, that anxiety or nervousness does not necessarily equate to fear. A Cockatoo may sometimes seem calm, not experiencing fear per se. But its anxiety levels are still naturally very high. When trying to find why Cockatoo parrots suffer uniquely, observing one breed in particular may lead us closer to an answer. All parrots are prey. And prey’s typical response to a threat is to flee. But not the Medium Sulphur Crested Cockatoo. In the wild, these birds have been known to mob-attack encroaching raptors. They have also been observed dropping stones and small branches into bat’s lairs in an unprovoked attempt to evict the bats from their territory. Sulphur Crested Cockatoo generally do not flee threats. They throw themselves at it in attack mode. This very aggressive fear response serves the Sulphur Crested quite well in their wild habitat. But when we try to make this animal into a pet, the delicate natural balance of a hyper-aggressive prey is thrown off. Now let’s take a moment to stretch our minds back to some obscure television programing. Do you remember the police serial Beretta? Robert Blake (of Little Rascals fame) played a police detective that owned a Medium Sulphur Crested Cockatoo named Fred. Fred was cute, smart, precocious and so very personable. He appeared to make the perfect pet. Actually, Fred was played by several different Sulphur Crested Cockatoos. Whenever one of the parrots playing Fred developed an anxiety disorder or began to pluck out its feathers, it would be replaced with a younger Sulphur. Because the show Beretta portrayed Sulphur Crested Cockatoos as such great pets, the popularity of these birds quickly increased. The demand went up and the market rose to the occasion, supplying Sulphur’s to an unwitting public. But after these birds were brought home by ill-prepared owners, the bird’s true nature would invariably emerge. Because they are not fond of feeling cornered, these parrots can be shockingly aggressive when confined to cages. The ensuing bites, injury and bloodshed would usually result in the Sulphur’s removal from the home. This phenomenon is what I call the “101 Dalmatians Scenario.” Popular media makes an animal appear desirable as a pet. The animal becomes popular, but that popularity crumbles as owners encounter how difficult the animal is to own. The result is that unmanageably high numbers of the animal are abandoned in a short period of time. Rescues and sanctuaries quickly fill to overflow, and the “unlucky ones” are largely euthanized. Even without the dramatic spiral of the Dalmatians Scenario, the difficulties Cockatoos endure in a domestic setting are obvious. Would you like to guess what type of parrot is most frequently abandoned? I’ll give you a hint; it’s a type of Cockatoo. The Umbrella Cockatoo. The popularized image of the Umbrella Cockatoo is a parrot that is smart, precocious and personable. Sound familiar? It also mimics human speech very well, which leads us to mistakenly anthropomorphize it. When a parrot has a good capacity for imitating speech, we expect it will be like owning a small feathered human. Thusly, we oppress the bird with social expectations that we would only place upon other humans. 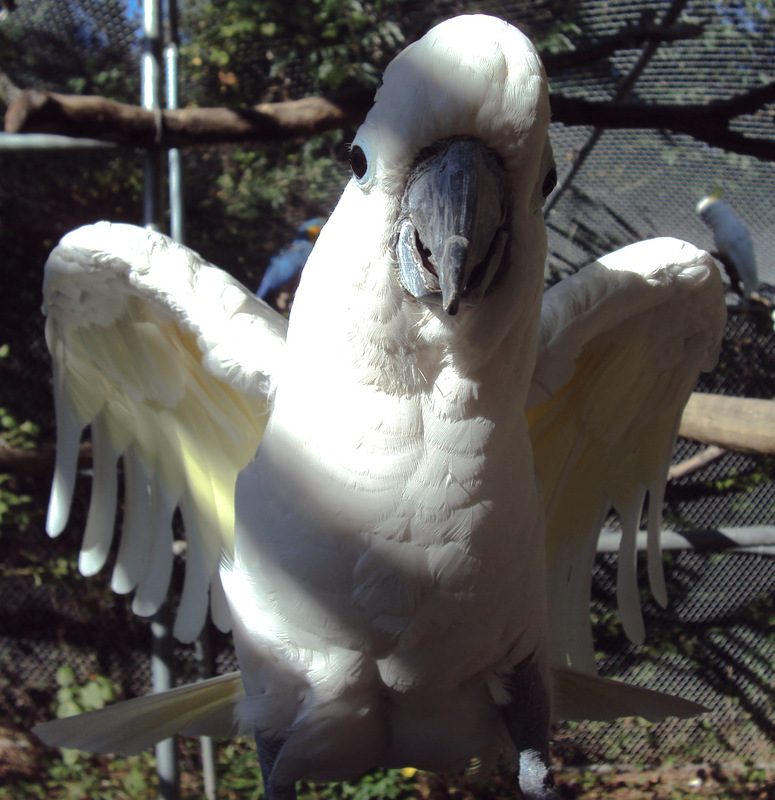 While the Umbrella Cockatoo is very smart, and can be very personable, the fact remains that it is a wild animal which originates from an unforgiving natural habitat. When an Umbrella feels threatened, it is remarkably effective at defending itself by delivering bites that may require medical attention. From Australia to the Indonesian Islands, Cockatoos evolved in harsh conditions replete with skilled and dangerous predators. In these natural environments, only the most attentive prey survive. Even a momentary lapse in vigilance can be fatal. We humans blithely ignore the fact that it is a wild animal by bringing them home and confining them to cages. The excruciating boredom of captivity paired with relentless, unmitigated anxiety causes a Cockatoo’s mental and emotional balance to unravel. This is why we see such extreme non-pathological problems in captive Cockatoos. If I could have one magic wish granted that would help all parrots, I would wish humans realized that a parrot in a cage is no better off than a dolphin in a bathtub. I would wish this for the benefit of all parrots. But I might wish it mostly for the salvation of the wild Cockatoo heart.